Billy Blanks is the creator of Tae Bo®, the revolutionary total body fitness system that has helped millions of people around the world get in shape and feel great! He has also devoted a great deal of time toward helping people through his Foundation and by traveling around the world to train the U.S. Armed Forces. In addition, Billy's extraordinary achievements as a world karate champion, actor, author, motivator, philanthropist and humanitarian continue to earn him acclaim. Billy's rise to success seems all the more astonishing when seen through the prism of his childhood. Born the fourth of 15 children to Isaac and Mabeline Blanks, he had few opportunities on the mean streets of Erie, Pennsylvania. Complicating his young life, Billy was afflicted with undiagnosed dyslexia and suffered a problem in his hip joints, which impaired his movement, resulting in a clumsiness that caused his coaches to think he would never amount to much. However, Billy took his first martial arts class at age 11 and soon began to gain a mastery of the sport and himself. In 1975 he became the first Amateur Athletic Union Champion, a title he would earn five times. Billy ascended to become a seventh-degree black belt in Tae Kwon Do and gained black belts in five other forms of martial arts. He became a seven-time world karate champion, captained the U.S. karate team, won 36 gold medals in international competition and earned admission to the Karate Hall of Fame in 1982. Billy Blanks also became the 1984 Massachusetts Golden Gloves Champion and the Tri-State Golden Gloves Champion of Champions. Billy moved to Boston as an adult and opened his own karate studio. It was there, while combining dance moves and Tae Kwon Do, that he unintentionally hit upon the concept for Tae Bo®. Billy moved to Los Angeles in 1989 and taught classes in his garage. Shortly after, he opened the Billy Blanks World Training Center in Sherman Oaks. Word of mouth brought the early clients, but when singer-dancer Paula Abdul came through the door and the dramatic benefits of Tae Bo® became quickly apparent, the business took off. Most recently, celebrities like Charlotte Ross of "NYPD Blue", Melissa Reeves of "Days of our Lives", actress Alicia Coppola, actor and country music star Scott Reeves, Stephanie La Grossa of "Survivor", Kendra Todd of "The Apprentice", actor Lou Diamond Phillips, Trista and Ryan Sutter from "The Bachelorette", and former Philadelphia Eagles star Randall Cunningham have also been reaping the benefits of Tae Bo® and BootCamp™. Lou Diamond Phillips says that he gets cut more quickly in Billy's classes: "I have not seen faster results than through Tae Bo® or Boot Camp™." Countless other celebrities are also believers, including Pamela Anderson, Justine Bateman, Catherine Bell, Valerie Bertinelli, Neve Campbell, Rae Dawn Chong, Rebecca De Mornay, Farrah Fawcett, Viveca Fox, Goldie Hawn, Queen Latifah, Emmanuel Lewis, Ryan O'Neal, Lisa Rinna, Lela Rochon, Jack Scalia, Connie Selleca, Brooke Shields, Sinbad and Shannon Tweed. Athletes seeking to stay in top physical shape have also flocked to the studio, including Wayne Gretzky, Bruce Jenner, Magic Johnson and Shaquille O'Neal. Concurrent with his rise as a fitness expert and physical trainer to the stars, Billy has also built an impressive resume as an actor. He has appeared in 18 movies including Kiss the Girls, The Last Boy Scout, Bloodfist, Lionheart, Talons of the Eagle, Back in Action, Stand Alone, Balance of Power and The King of the Kickboxers. On television, Billy has been seen in such episodic shows as "Sabrina, the Teenage Witch," "The Parkers," "Suddenly Susan," "ER," "Melrose Place," "Martial Law," "Street Justice" and "Spenser: For Hire." Whatever incredible project he may be working on, Billy has made helping others a top priority in his life. The most vibrant example is The Billy Blanks Foundation. Established in 1999 by Billy and his wife Gayle, the foundation is dedicated to equipping high-risk individuals with life skills that allow them to achieve their full potential. Billy has also done notable work with the military. He frequently travels with members of his family, including daughter Shellie, thus helping to integrate cross-gender, generational and racial messages into their appearances at training camps and hotspots worldwide. Billy's work with the military has included trips with his daughter to Iraq, Bosnia, Kosovo, Sarajevo, Greece, Africa, Germany and Italy, to work with members of the U.S. Armed Forces. Despite his achievements, Billy isn't resting on his laurels or anything else. Out of bed by 5:30 a.m., he still teaches at least two Tae Bo® classes and a few martial arts classes each day at his studio in Los Angeles. 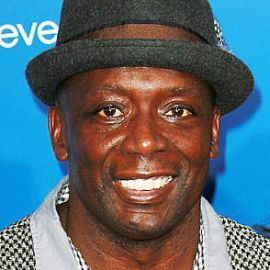 He is married to his teenage sweetheart Gayle, co-founder of the Billy Blanks Foundation, and is the proud father of two children, Shellie and Billy Jr. Fitness Expert, Former Trainer on "The Biggest Loser"